That’s the top question in our idea collector, so let’s go at it. Here’s part 1, in which I say, “Try everything but training.” We’ll cover needs analysis, job aids, help screens, and the radical idea of making the software easier to use. Later, I’ll publish part 2. In that part, we’ll look at how to design practice activities for times when the everything-but-training approach isn’t enough. Action mapping begins with identifying how the organization will benefit from the project. The goal justifies the existence of the “training” (and of your job). Sales to new customers will increase 5% by [date] as all sales reps correctly use NewCRM to identify new prospects and build relationships with them. If your stakeholders refuse to commit to a business-performance goal, you might try a weaker but still useful type. For example, you could measure the strain that new software can put on productivity. For example, if the new software is already in place and causing confusion, you can try to reduce the number of calls to the help desk. List the most common tasks that people will use the software to complete. Also consider what might make each task difficult. For example, is it obvious how to complete the task in the software? 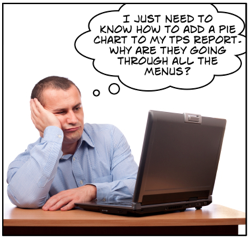 Are people working under time constraints? This flowchart helps you consider all the angles. Many people assume that every new system must be introduced with formal training. But is that always necessary? How different is the software from what they’re using now? How tech savvy are the users? How complex are the tasks that the software is used to complete? How horrible is the outcome if someone screws up when using the software? How clumsy is the software interface? How much help is built into the software? 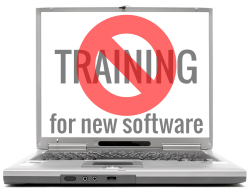 If the software is clumsy and its help system is unhelpful, that doesn’t mean that you have to develop training. It means the software should be made easier to use. L&D staff are often surprised to discover that they can request changes to software — but they have to ask. Don’t assume that it’s too late to change anything. If the software is from a third party, making it easier to use would help their sales. If the software was developed internally, there’s no excuse for refusing to make it easier. Clumsy software hurts performance. Make a list of changes that will reduce the need for training. Take screenshots and scribble on them. Write the help blurbs that are missing. Point out where there are too many steps. If the software is hard to use and the developers have rejected your requested changes, that still doesn’t mean that formal training is your only hope. How about some job aids? A job aid is a reference that gives you just enough information. It can be a piece of paper, a page on the intranet, a short how-to video, a help screen, or anything else. We can use Moore’s Machete of Awkward Oversimplification to divide software job aids into two groups. A short article in a knowledgebase shows you how to record a partial refund in the accounting software. A quick video shows you how to create a template for your marketing emails. The built-in help system highlights the commands you need to use to escalate a customer complaint in the CRM. An extensive, structured document helps you install WordPress, as deconstructed by Dave Ferguson in his handy site about job aids. These are all aids that help you complete tasks. They aren’t the painfully ubiquitous tour of the menus or alphabetical list of all commands. Don’t force-feed everyone with information in your job aids. Let experts skip ahead while novices read deeply. Here’s an example from Dave Ferguson of a job aid designed to satisfy both groups. Help screen or job aid? A common practice is to use a help screen to give a quick overview of how to complete a small task. For longer tasks or more detail, the help screen could contain a link to a video, knowledgebase article, or other reference. People should be able to use the software and view the reference at the same time. For example, a reference that opens to the side is way more useful than one that opens in the same window as the software and blocks it. For a lot more about job aids from real job aid experts, see Job Aids and Performance Support by Allison Rossett and Lisa Schafer. Test your job aids on a sample of future users and tweak them as necessary. If it looks like the job aids alone will get people up to speed, release them into the wild. Tell everyone where they are, make them super-easy to find for the people who missed the memo, and provide a quick feedback mechanism so users can tell you how to improve them. Let the job aids do their thing for awhile, and then check the measurement in your goal. Has it improved? Also, have managers reported better use of the software? Has the help desk seen a decrease in the number of calls? If so, you might be done. You can make sure you’re done by using Robert Brinkerhoff’s Success Case Method. In part 2, we’ll look at what you might consider if you decide formal training is necessary. March 7, online: Join the discussion about action mapping, scenarios, and who knows what else at TLDCast. 11 AM US Eastern time / 4 PM GMT. May 16-18, Auckland, New Zealand: I’ll be presenting at the NZATD Conference along with many interesting colleagues. In an informal post-conference session, we’ll discuss ninja mind tricks that will help us understand and change our clients’ mindsets and move us out of the order-taking role. Interview: Jo Cook recently asked me good questions in this five-part interview. I ranted a bit about instructional design degree programs and pointed out that spaced learning gives advantages to trainers as well as learners, in addition to covering some action mapping concepts. Interview: Connie Malamed also asked good questions about action mapping and the state of the instructional design world for her podcast. We considered whether instructional designers should be responsible for “solving all workplace problems,” the advantages of branching scenarios, the many ways to deliver stand-alone activities, and when action mapping isn’t appropriate. Webinar with lively chat: Many blog readers and I recently talked about three ways to motivate learners in a chat-filled webinar. View the recording and try some sample activities. Can we use scenarios to teach concepts?